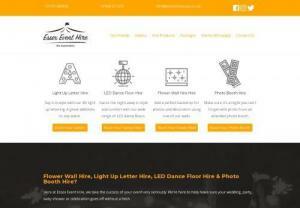 Flower Wall Hire, Light Up Letter Hire, LED Dance Floor Hire & Photo Booth Hire? Here at Essex Event Hire, we take the success of your event very seriously. We're here to help make sure your wedding, party, baby shower or celebration goes off without a hitch. Our product list is constantly expanding, and currently we have amazing offers on both our Baby Shower Hire Package, and fantastically beautiful Wedding Hire Package which are sure to give your event the WOW factor.